With the holiday season quickly approaching and the atmosphere becoming more festive by the minute, it’s time to begin planning for your fabulous holiday parties. Between the cooking, cleaning, planning and decorating, it’s easy to overlook the small details involved in party planning. Decisions such as which color tablecloth to use, how many seats to plan for each table and what the menu should be often overshadow smaller, more personal aspects of party planning. However, the small decisions are just as important as the big details. Little things such as creative, personalized place cards can easily take your party from ordinary to amazing, and we’ve gathered our favorite place card ideas for holiday inspiration! Add a pine cone to your place setting to display your place cards. Wrap wire in a circular shape then attach the wire to the top of the pine cone to hold the place card. For a creative twist, paint the pine cones a festive color like gold or red. Visit blog.simplelittledetails.com for more information. These gorgeous pumpkins are the perfect place setting for Thanksgiving dinner! Use twine or ribbon to tie the place card to the stem of a pumpkin. Bonus points if you use a fall-themed shape for your place card. Your guests won’t “be-leaf” their eyes when they see this stunning place setting. Start by gathering large leaves or buying decorative leaves from your local craft store. Use gold spray paint to coat the leaves. Let dry, then write each guest’s name on the leaf and place at each setting. Visit mylifeandkids.com for more information. Use a small, potted succulent for each place setting. Attach each guest’s name to a short skewer to stick in the soil of the succulent. This place card holder doubles as a unique party favor that guests will be able to take home with them! Visit ruffledblog.com for more information. For a more rustic place setting, use a cross cut of a branch or tree for your place setting. Use a marker to write your guests’ names on the wood. If you don’t have access to tools to cut up a branch, these cross cuts can usually be found at craft stores. Visit tarateaspoon.com for more information. Use rosemary or pine sprigs to add a natural, simple touch to your table. These place settings not only look gorgeous, but also smell amazing! One option is to place the sprigs through the card, or wrap the springs into a wreath shape to place on top of a napkin or dish. Visit tarateaspoon.com for more info. Jingle bells! Use bells to hold your place cards. This simple yet creative place card holder is sure to spread good cheer (and maybe a few jingles) around the dinner table. Visit jacolynmurphy.com for more information. Remembering the small details during the busy holiday season will make any party complete. With these adorable place settings, guests are sure to remember your holiday party as being the best of the season. Happy Holidays from all of us at Columbia Metropolitan! On a recent trip to my hometown of Augusta, Ga., I embarked on a journey to learn all things — kitchen. 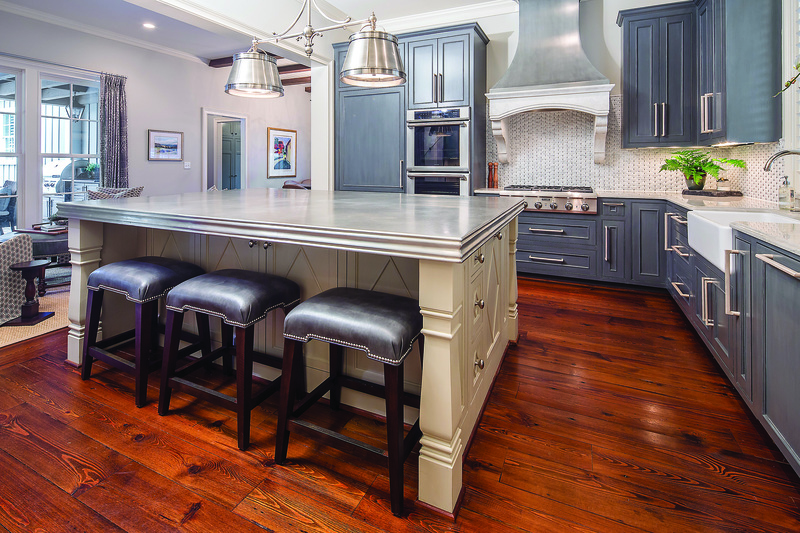 From new design trends to how-to’s and organizing tips to the simple touring of these immaculate renovated and new construction kitchens, it was a wonderful weekend of inspiration put on by the Augusta Symphony Guild. Because we all love to look at something beautiful and glean anything we can for our own abode, I’m sharing each step along the way. The affair began on Friday night with a “Toast to the Tour” party hosted by local florist, gift and registry boutique as well as event planner, Charleston Street Interiors, Fine Flowers and Events. On the fountain level of Surrey Center, drinks were flowing, food was being prepared by local chefs and a silent auction and $10,000 drawing were being conducted. It was an eventful night leading up to a long day of demonstrations, presentations and self-guided tours around the Forest Hills and Summerville neighborhoods of Augusta and the riverfront neighborhood of Hammond’s Ferry in North Augusta. First stop, 3214 Candace Drive — the updated traditional. This Georgian-style home was built in 1979 and has undergone serious renovations and additions over the past few decades. It features a unique fusion of antiques and new furnishings that makes each space personal and graceful. 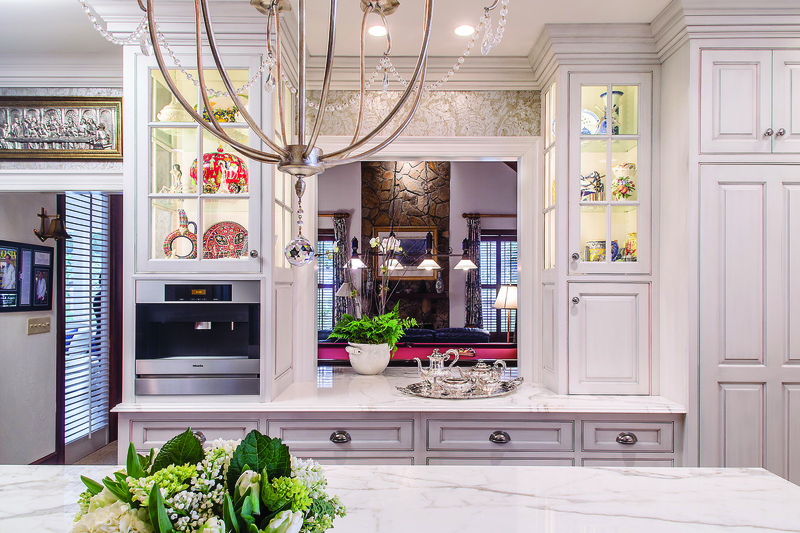 These glass cabinets display treasured collections from a lifetime of world travel. The open floor-plan was designed for practicality and flow as well as function. 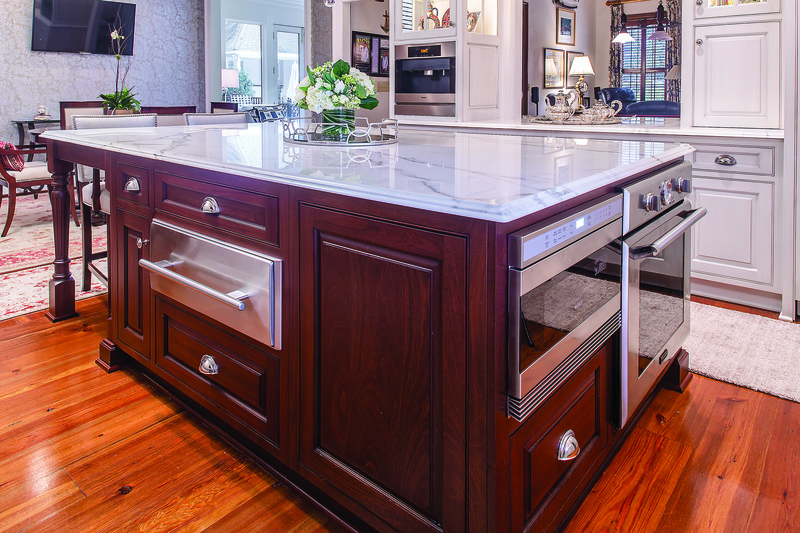 The Mahogany and Premium Calcutta gold marble island features warming drawers and an under-counter oven. 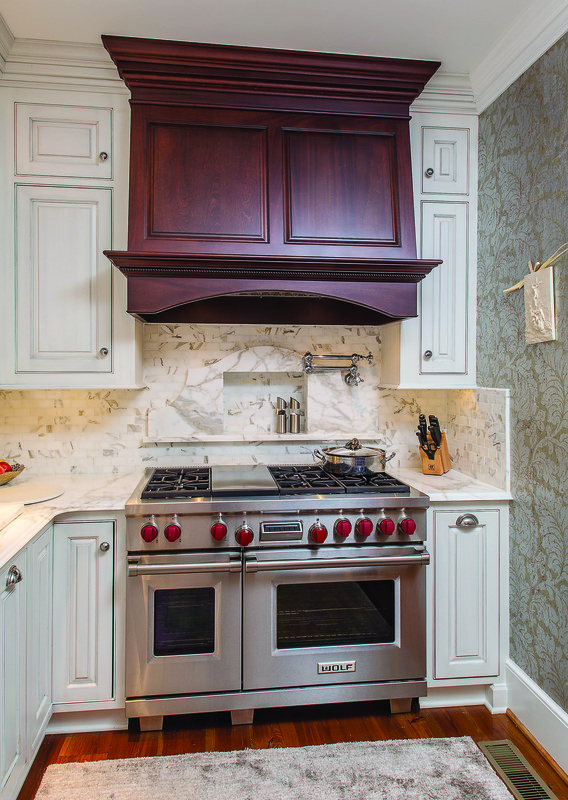 The stained mahogany hood over a stainless steel Wolf 48″ Duel Fuel Range creates a perfect contrast to the French-inspired wallpaper. Continuing down the street to 808 Aumond Place East, we came across this custom-built home that was created after years of searching for the perfect house and coming up empty. Another updated traditional. Built in 2014, this house has almost no space left undefined or without purpose and also holds up to “dogs and feet.” Here, guests were invited to join Organizing Living Coach Marin Rose of Libra Organizing as she presented mini-sessions addressing a variety of home organization challenges. Topics included scheduling and time management, letting go of “stuff,” negotiating conflicting organizational styles in the home, getting kids to contribute and, of course, kitchen organizing! The centerpiece of this kitchen is definitely the pewter countertop of the island, matching the stove’s hood, which will patina with age. Ceiling beams define the breakfast area from the sitting and kitchen area (where the couple enjoys daily coffee and the morning news). 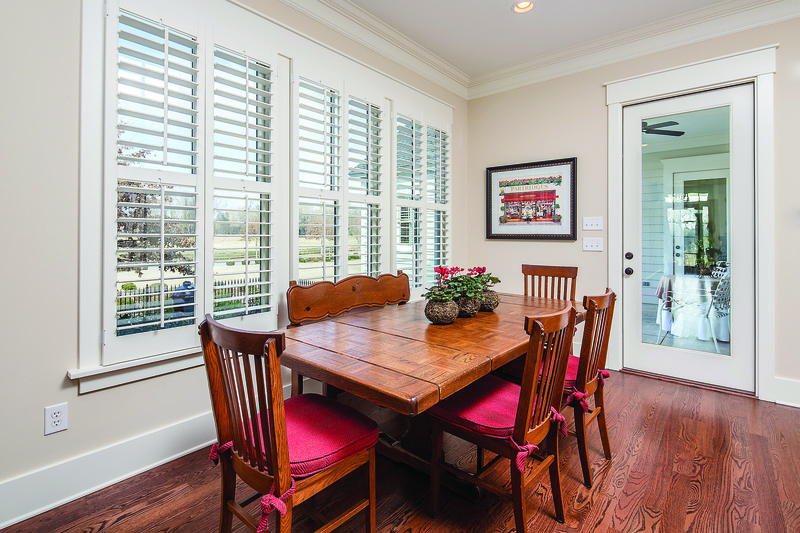 Featured in this kitchen is a perfect arrangement of food preparation areas as well as eating and conversation spaces. This home also includes a fantastic outdoor entertaining area with multiple seating arrangement areas. The outdoor “kitchen” incorporates steel gray honed granite countertops and FireMagic and Kamado Joe grills. The transitional kitchen. Blending the old and new at 1121 Johns Road. 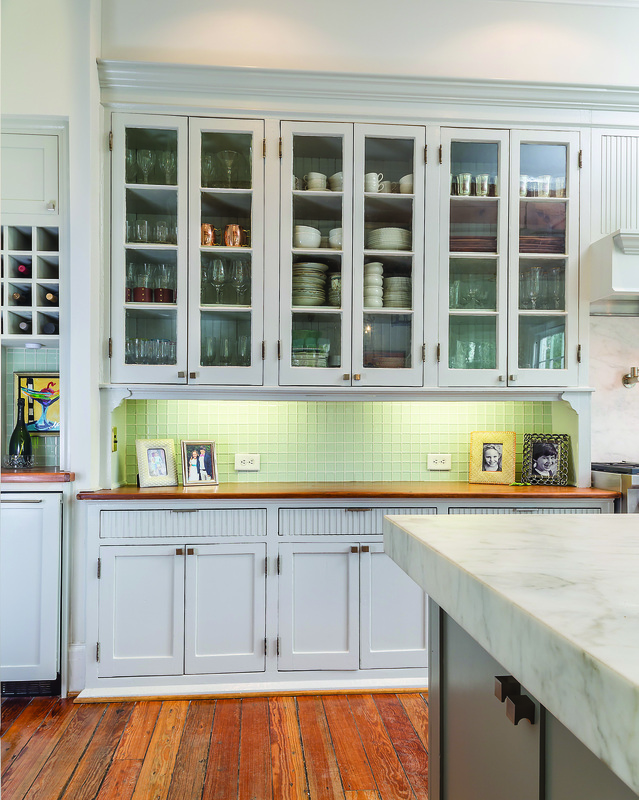 This home was built in 1913, but it’s original galley kitchen was remolded in 2013 while making sure to include some of the original cabinets. The seamless integration of new and original pieces is the true art and heart of this home. 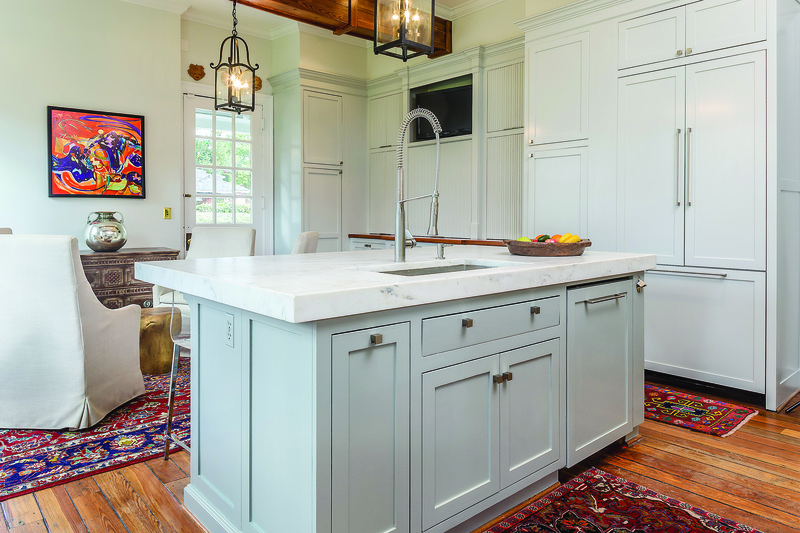 While admiring the amazing transformations, MERIT Flooring Kitchen – Bath answered kitchen and bath design questions, demonstrated Chief Architect software and presented innovative design boards. Contemporary meets classic with the acrylic and stainless steel chairs pulled up to the large Calcutta Caldia white marble countertop. 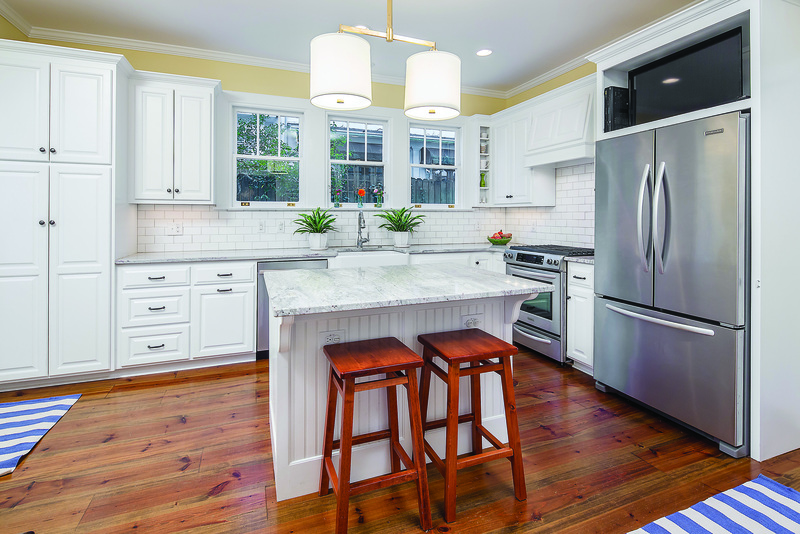 The original cabinets and pine countertop were updated with a clear glass-tiled backsplash, fluted drawers and brushed satin nickel right-angle knobs and pulls. The Wolf range with pops of color and a custom-built painted wood hood. These homeowners incorporated colorful artwork to continue with the elegantly eclectic feel. 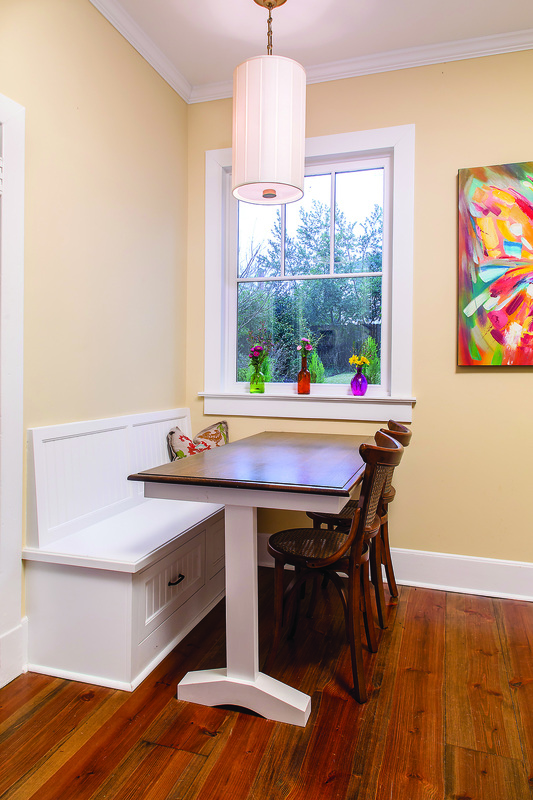 This conversation area allows guests and family to be close but not underfoot while the chef is working in the kitchen. Then on to the traditional 1917 cottage at 1209 Anthony Road. These homeowners started reconstruction in early 2013 which took three months and getting down to the studs on all walls, floor and ceilings. The laundry room was relocated out of the kitchen and upstairs to create room for the island, breakfast area and extended storage. The layout allows for the cook to have direct access to everything they need while guests can still make it to the fridge and have a seat to catchup during preparation. White cabinets, countertops, sink and subway tile open this cottage kitchen and make it look sleek and uncluttered. The three large windows over the sink, which are original to the house, look over a small secret garden. Pops of color in the artwork, plantings and horizontal stripe rugs offer just the right amount of whimsy. The quaint dine-in breakfast area. Crossing over the Savannah River to the picturesque neighborhood of Hammond’s Ferry to visit 512 Front Street, you see children playing, people lunching and urban farms thriving while bicyclers hop on the path lining the river right across from this perfectly perched 2014 built home. 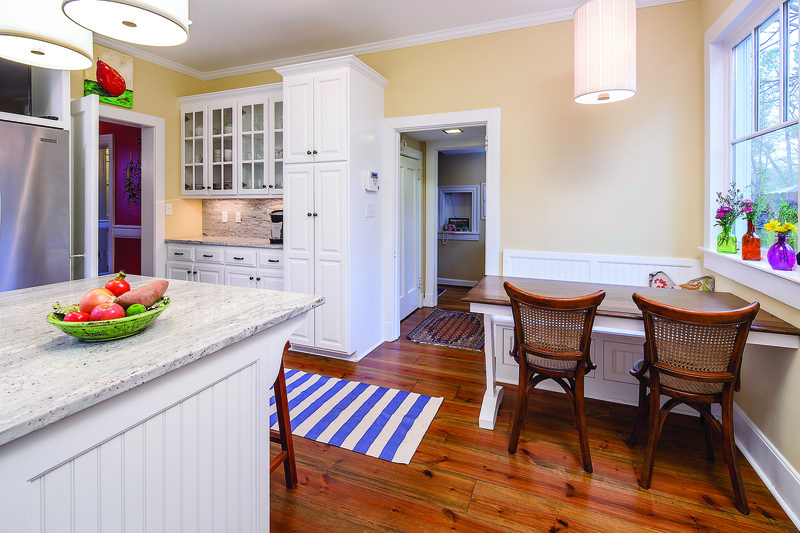 The walnut based, maple butcher-block island is extra-large to accommodate the home owners’ large family. 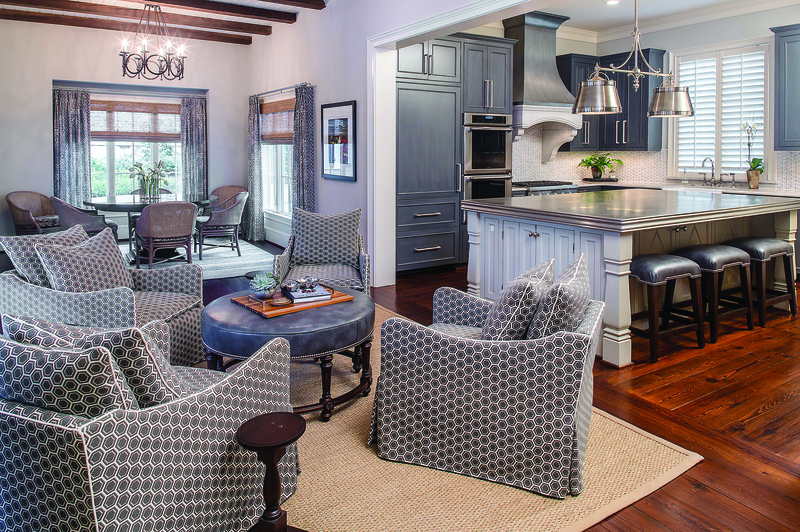 Rich colors and textures fill this home to encourage family time, open spaces and efficiency. The brick and mortar pillars were designed by the husband and the beams of the ceiling are ages old. 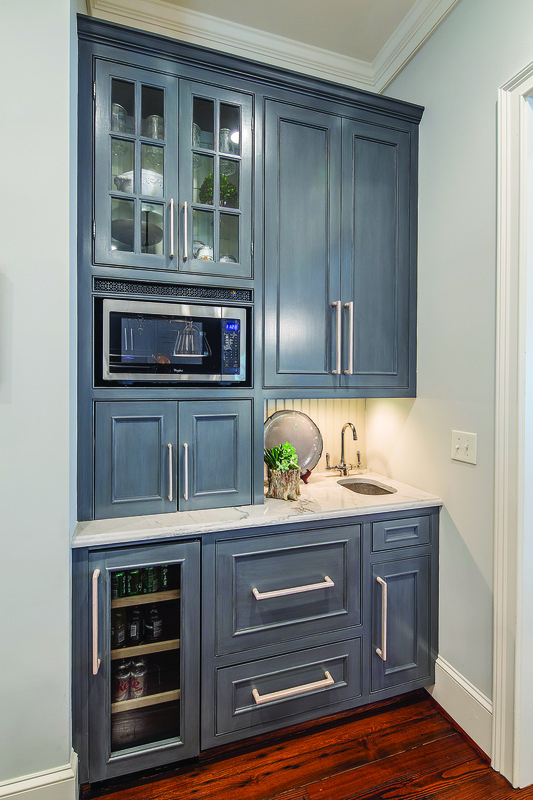 The pantry, located between the kitchen and dining room, works as a second kitchen space for entertaining (it includes a second sink, dishwasher, microwave and extensive shelving). 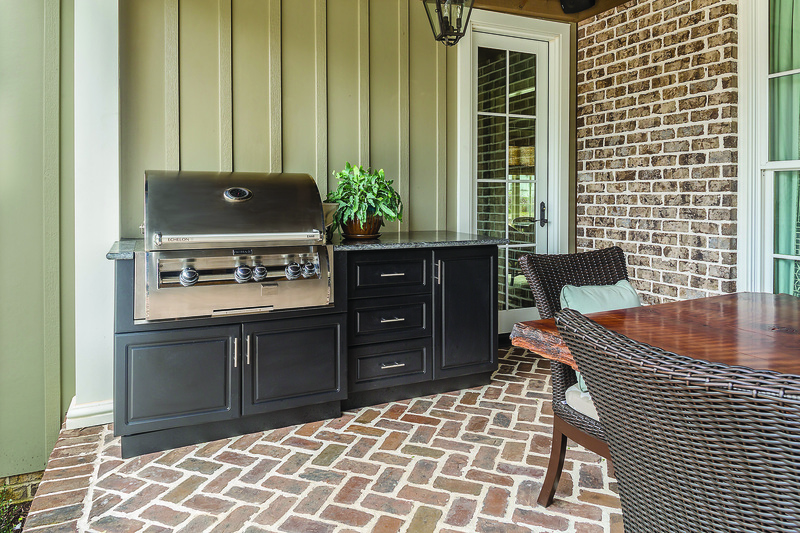 A step out back leads onto a back covered porch showcasing an outdoor kitchen fit for a chef. 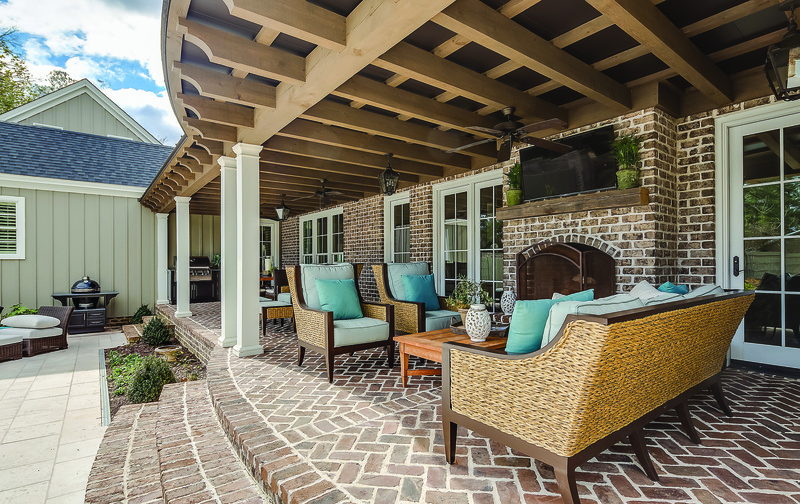 This covered brick porch is the perfect place to enjoy a sunset with a view or a cool summer night by the fire. A few steps down the block brought us to 19 Phoenix Street — an open traditional kitchen. 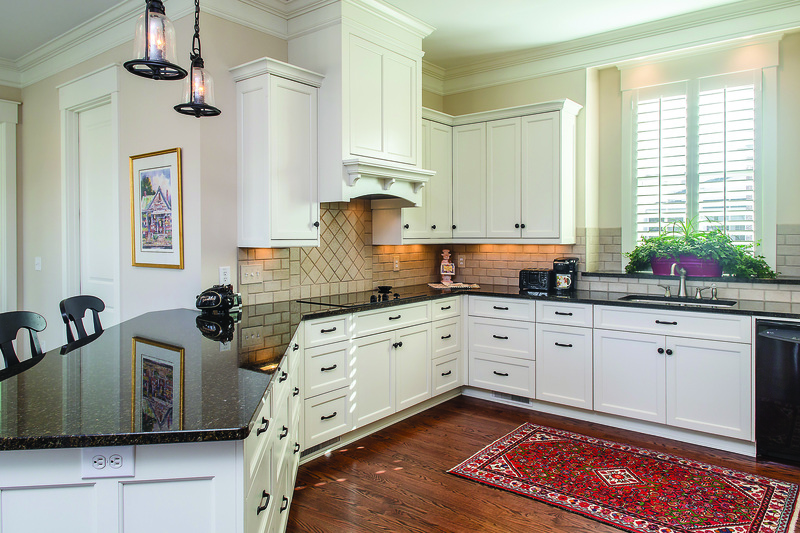 Here, Nandina Home & Design presented The 4-1-1 on Kitchen Design — a visitor favorite! 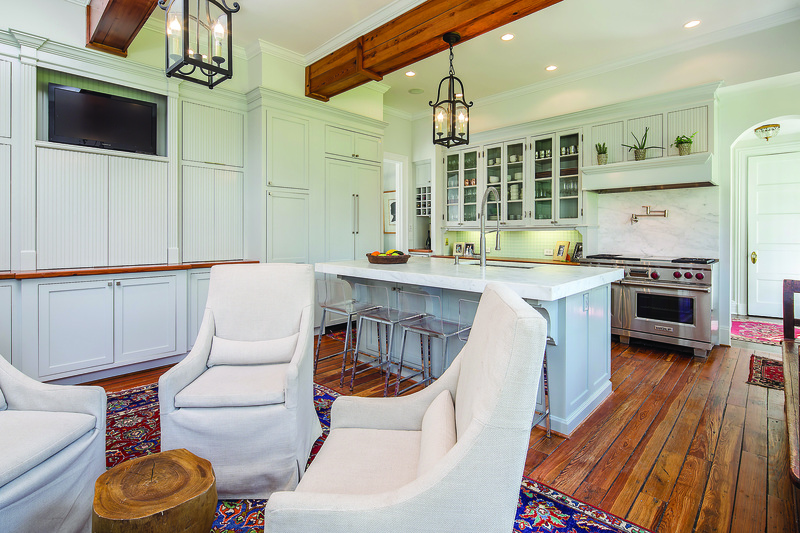 Susan Victor, owner of Nandina and one of the lead designers, shared the design secrets of a successful kitchen project. 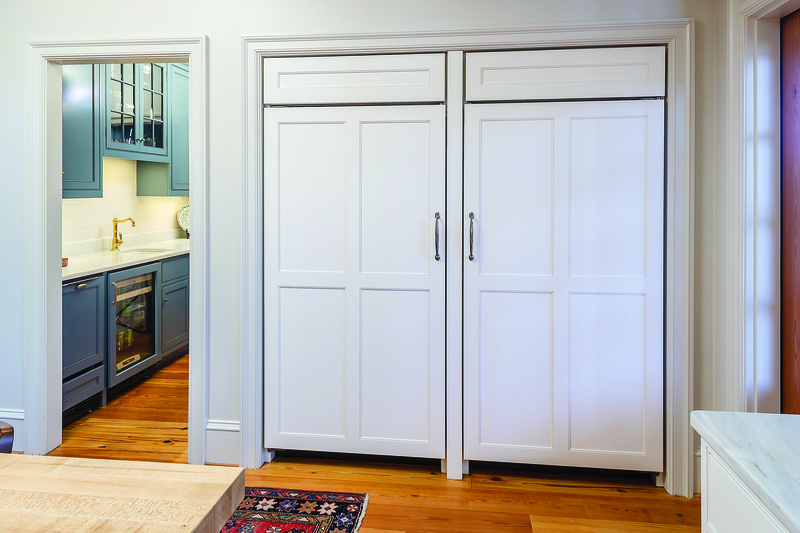 From budgeting, surface selections, space planning and appliance selection, to the “staying power” of specific styles, Susan took us through every component of the design process. This kitchen was one of my favorites because of it’s warm and inviting atmosphere. The custom wood hood is finished with Charro tumbled travertine underneath. 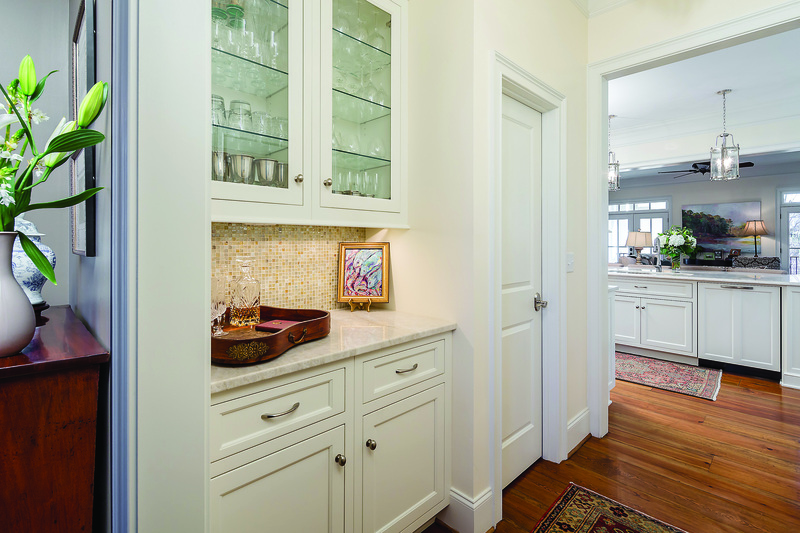 The kitchen area feels larger due to ceiling-high cabinets and a light color palette. The countertops are an “unmoving pattern” of Quartzite. This entire home was meant for family gatherings with each room flowing easily from one to the next. Not ready for the tour to end, we sadly came to the last stop of the day, 538 Front Street. This riverfront home incorporates an open floor plan that blends well with family furniture accents. Here we met interior designer and decorative painter, Brittany Wallace, as she presented a multi-faceted mini-session on the importance of technical design when building, remodeling or updating. She instructed visitors on how-to mix color, patterns and textures in the interior spaces as well as the impact of wall colors, finishes, fabrics and art — complete with examples of fantastic finishes for walls, ceilings, furniture and cabinets! 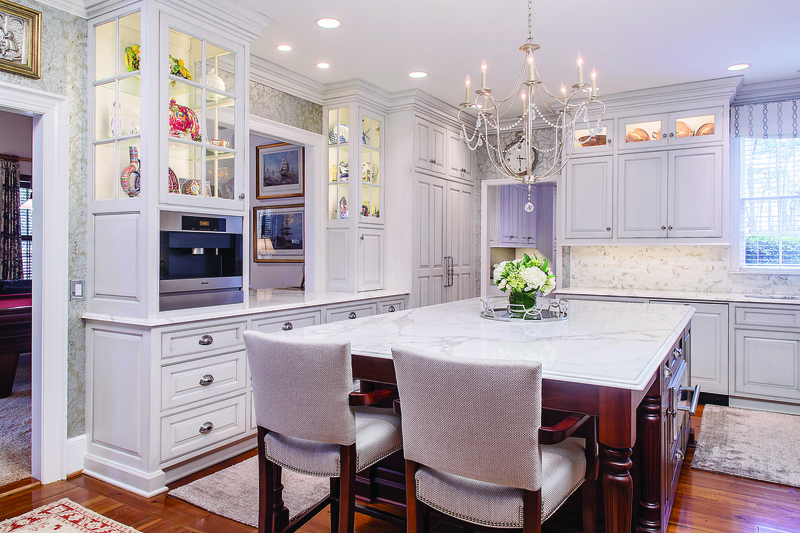 The extended breakfast bar allows for the cooks and guests to be in the same space without being in each others way — a common problem in the heart of the home. White cabinetry perfectly frames the bold, black appliances. 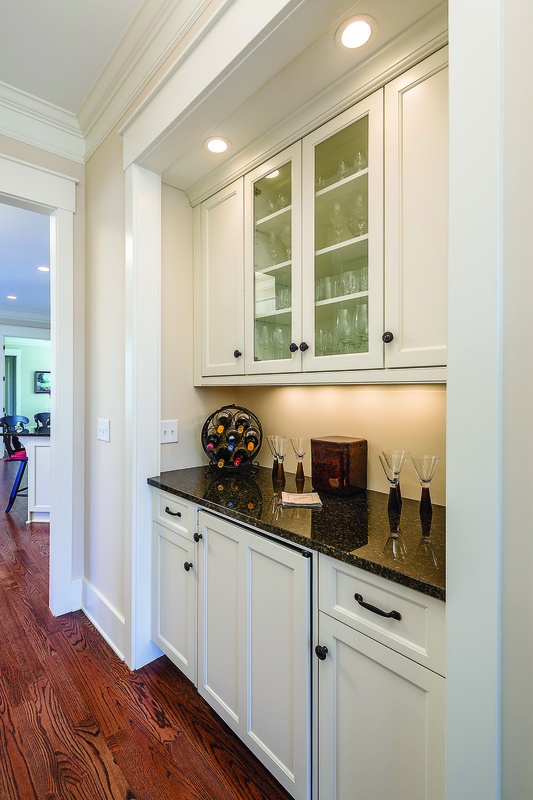 An extensive pantry and this perfectly placed bar area house food items as well as long-gathered entertaining pieces. The breakfast area features an old parquet table to further present the mixture of family belongings and new conveniences. These kitchens demonstrate that anyone can do it, with any price range. 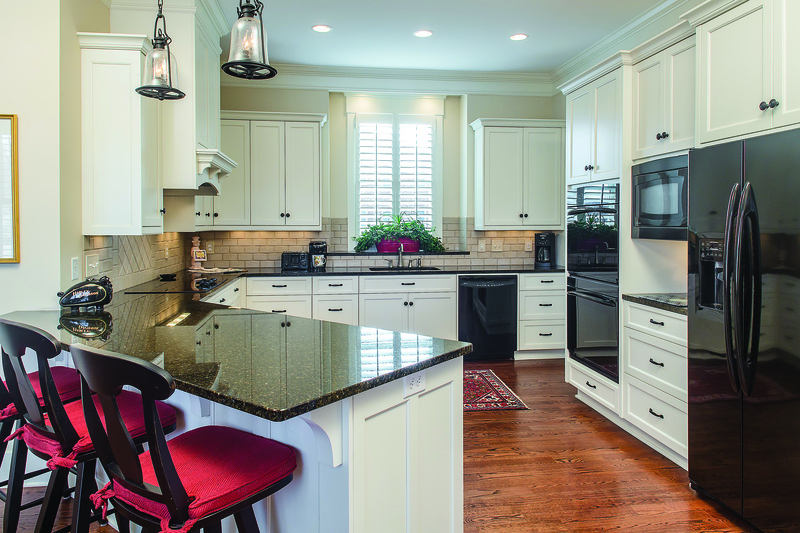 From cottages to expansive historic homes, the Augusta Symphony Guild Tour of Kitchens was a must-see! It happens yearly, so I recommend adding it to your bucket list.